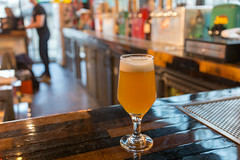 Hop and Grind reminds me a lot of one of my other perennial favorites, Worthy Burger, it’s designed as a beer bar that uses a “light service” approach: you order your burger at the counter, and then go take seat at a table or the bar, and they bring your order out to you. It keeps things relatively simple, lowers costs, and while you’ve got to occasionally wait in a line, keeps things moving pretty smoothly. The bar, by the way, is one of the attractions here. 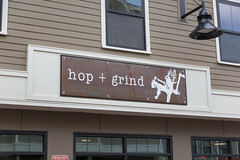 While NH has taken a bit longer to get up to speed with the craft brewing movement, in the last two years or so it’s finally taken off here as well, and Hop & Grind is fully embracing the NH beer scene; while I was there, all of their taps were local NH craft brews, mostly from breweries I’ve enjoyed around NH, like Backyard Brewing, 603, Kettlehead, Bad Lad, and Chapel & Main. Indeed, while they had a few out-of-state beers available in cans or bottles, I enjoyed that the entire tap list was NH beers (Live Free or Die! ), and all of the taps were also five gallon kegs rotated out as they empties, so there’s a lot of turnover. Really, it’s one of the best beer bars I’ve found in NH, and probably the best for focusing on NH beers. But… back to the burgers. 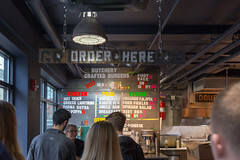 The whole deal at Hop and Grind is that they are doing a selection of burgers (beef, chicken, pork, and a few others) by doing their own butchering and grinding the meat fresh, including mixing spices and other meats into the grind. So ordering up a basic burger, you get a nice patty of freshly ground and grilled beef, basic toppings, and fries… for $5. What?! Yup. While the burger has been having a renaissance much like craft beer has been, an unfortunately byproduct is that a lot of places are now hawking “craft” burgers for some rather serious cash (back home in Hanover, NH, the town is full of places selling $15, $16, and $18 burgers!). But into this scene, in a college town, Hop & Grind is selling a basic cheeseburger, grilled to order, with fries, for a mere $5. No wonder the place has a line out the door. 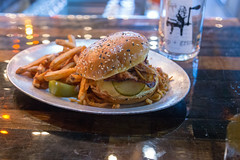 Myself, I couldn’t resist a few upgrades, going for the “Belly” (bacon cheeseburger, with two thick slices of bacon) and upgrading the fries to salt and truffle vinegar…. all for a mere $8. So, how was the burger? I’ll have to say, this was a damn fine burger, especially for the cost. It’s not a huge or thick burger (not surprisingly, given the cost), but it was a decently sized patty cooked with a good sear, a juicy interior (a result of the fresh grind), and a lot of flavor. Add in some house-made pickle, onion, tomato, and two slices of cheese (both cheddar and American), and a well-toasted white-and-black sesame bun, and two smoky slices of bacon, and I truly enjoyed this burger; I may have to come back and try the basic “Hi-5” cheeseburger. I’ve paid a lot more money for less enjoyable burgers, and they’ve got all of the basic “bar burger” aspects nailed: toasted bun, good sear on a juicy patty, and some fresh toppings. The fries? Handcut fries, freshly cooked, and… well, to me, a bit flat. Don’t get me wrong, these were decent enough fries, but definitely an example of the handcut, single-cooked (instead of proper, double-cooked fries) variety and these were a bit dry. For tallow-cooked fries I actually expect a bit more, but hey, maybe next time I’ll try the spicy ones instead. Oh, and along with the fries was a pleasant surprise: a nice wedge of pickled green tomato. Fries notwithstanding, I really enjoyed Hop and Grind. I can see why it’s hard to get in the door on a Friday night; the place has some great brews, some great burgers, and a really nice retro vibe with a friendly staff… all at prices that are almost retro in themselves. I’m actually looking forward to my next trip to Durham.